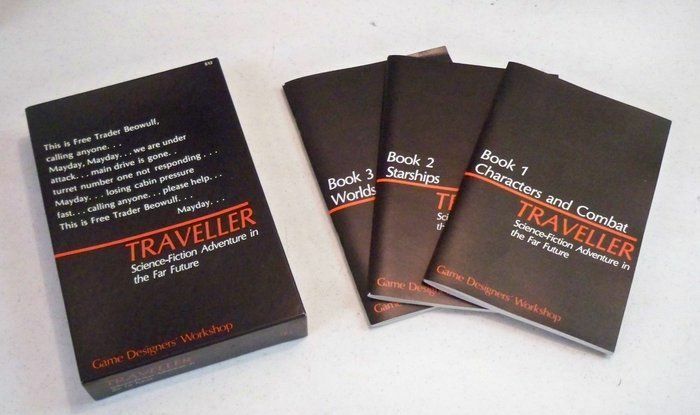 Okay, it’s tough to talk about old school roleplaying games without touching on Classic Traveller at some point. I mean it was one of the first science fiction RPGs (Metamorphosis Alpha came out a year before Traveller, and Empire of the Petal Throne could also be considered SF). Traveller initially did not have much of a background, but was aimed squarely at the sort of fiction that was being written by Poul Anderson, H. Beam Piper, and Keith Laumer. While the setting had FTL travel, other examples of advanced technology were not as common and technology levels varied from world to world. Most weapons were still standard firearms, and swords and dueling were not uncommon. Suffice to say that this was not Star Trek, nor was it Star Wars. If I were to compare it to movie or TV show, I would have to say that it’s closest to Firefly/Serenity. Character generation in Traveller was somewhat notorious for the possibility of characters dying during character generation. Traveller uses a lifepath style of character generation, and during each term of service, there is a survival roll. Later editions of the books added an optional rule that instead of dying, your character was injured and received a medical discharge. The random stat rolls and the randomness of the lifepath could generate some strange characters, but like Basic D&D, that randomness could sometimes hand you a character that you would have never considered. I’ve also been told that, originally, characters that died during generation were supposed to handed over to the GM for a ready supply of NPCs. Unfortunately, I have no way to confirm this as I have later printings of the books. For this article I will only be using the Little Black Box books, Books 1 through 3, and I will not use the optional survival rule. My first attempt at a character resulted in crappy stats: UPP 478644, so I enlisted them in the Scouts since they have the highest survival failure rate… and they ended up dying in their 4th tour of duty. IISV Aurora declared missing, presumed destroyed with all hands on board, year 1106 Imperial Calendar. My second character attempt, on the other hand, gave me an interesting character I wouldn’t have initially considered. Stats are generated in the following order: Strength, Dexterity, Endurance, Intelligence, Education, and Social Standing, and you roll 2d6 for each stat. And they are written in hexadecimal, so a 10 is an A, for instance. I started with a Universal Personality Profile (UPP) of 67697B. So I have a social standing of 11. That means she’s a noble with the title of Knight. Within the Third Imperium setting, the Navy is where the nobles tend to go, so I, of course, attempt to enlist in the Imperial Navy. I fail that roll, so instead my character is drafted. The draft is a d6 roll that determines what service you’ll be in. It is possible to get drafted into the same service that you failed to enlist in. Such is not my luck, and I roll a 6. I am drafted into ‘Other’ at the age of 18. Other has some interesting skill options, but they tend more towards criminal pursuits. Fifth Tour: Chose not to re-enlist, but rolled a 12 on re-enlistment so my fifth tour is mandatory; and I roll Social -1. Somehow, I lost my noble title here. At 34 years of age, and every 4 years after you are subject to potential aging effects. I get a little lucky here and only fail my aging roll for Endurance, so that goes down by 1 as well. And now, mustering out benefits and retirement benefits. Apparently even the criminal underworld has a retirement plan. I did five tours, so I get five rolls for muster benefits, and I also get a +1 on any rolls on the cash table because I have the gambling skill. For my five rolls I get: a high passage (1st class ticket to somewhere), a firearm (which will be an auto pistol because of skills), and three rolls on the cash table for a total of Cr 200,000. Finally, a retirement benefit of Cr 4,000 a month. So here I am, with a talented gambler that used to be a noble, has knowledge of the criminal underworld, and quite a bit of cash. Not to mention that the last tour was mandatory. There’s definitely a story here. Attempted to enlist in Imperial Navy. Mandatory reenlistment for fifth term. So, in conclusion, despite how much I prefer games that allow me to play the character concept I have coming in, whether it be point based, or just allowing the player to spend stats where they prefer… well, there’s a certain appeal to this random approach. Three of the more interesting Traveller character’s I’ve had were created this way.